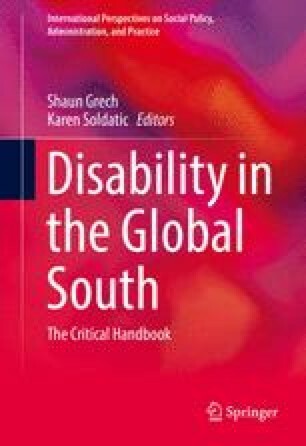 In this chapter we consider the ‘social model of disability’, developed largely by disabled activists in the UK, in relation to the different context and social realities of the global South, via a case study of disability theory and policy in Venezuela. We all value this approach to understanding the nature of disability, the realities of life as experienced by disabled people, and ‘what is to be done’ to improve the situation. However, we also take the view that ideological, theoretical and institutional reforms can be hard to understand, and that enthusiasm for the positive elements can obscure other elements that are less helpful (Burton and Kagan 2006). Díaz, R. (2012). Discapacidad y mirada colonial. Reflexiones desde perspectivas feministas y descoloniales [Disability and the colonial gaze. Reflections from feminist and de-colonial perspectives]. In M. E. Almeida & M. A. Angelino (Eds. ), Debates y perspectivas en torno a la discapacidad en América Latina [Debates and perspectives on disability in Latin America] (pp. 27–61). Paraná, Argentina: Universidad Nacional de Entre Ríos. Retrieved from http://www.bibliotecavirtual.info/2013/05/debates-y-perspectivas-en-torno-a-la-discapacidad-en-america-latina/. Finkelstein, V. (2001). The social model of disability repossessed. Disability studies archive UK. University of Leeds. Retrieved from http://disability-studies.leeds.ac.uk/files/library/finkelstein-soc-mod-repossessed.pdf. Government of Venezuela. (1999). Constitución de la República Bolivariana de Venezuela (1999) [Constitution of the Bolivarian Republic of Venezuela (1999)]. Retrieved from http://www.tsj.gov.ve/legislacion/constitucion1999.htm. Government of Venezuela. (2007). Ley para las Personas con Discapacidad (2007) [Law for People with Disability (2007)]. Retrieved from http://www.conapdis.gob.ve/index.php/ley-para-las-personas-con-discapacidad. Union of the Physically Impaired Against Segregation (UPIAS). (1974). Aims and policy statement. Retrieved from http://disability-studies.leeds.ac.uk/archiveuk/UPIAS/UPIAS.pdf.